Uh... No I wasn't in Armageddon. And there is no character called Hurley in that movie either. Add it to your IMDB profile....you can say you were on the role of Bruce Willis! Perhaps you were in Armageddon in your parallel life unbeknownst to you! We love you here, and I was very glad to hear you talking in spanish in the last episode. You'd think that the stay-at-home workers who staff ChaCha would bother to get that right, but for ten cents it's probably quicker just to spit any old answer out. But I could easily imagine you in that movie, Jorge! Ha! I'm a guide for ChaCha, and seems to me the slacker was the one who answered that question! Is there, at the very least, an affable slacker in that movie? Ha! That's awesome. But wouldn't LOST be even more interesting if you played a character by the same name in a movie about the end of the world? It's on the internet, so it mujst be true! You wouldn't have wanted to have been in that movie anyways, cause you can't itch your nose in a space suit. It would drive you nutty. How awesome would it have been to have Hurley walking around in "Armageddon", though? Oh man, I like this film! maybe, they thought, that in the Bruce Willis role was you??? Well, it does say "unreality" under that laughable answer... Maybe they're inventing a whole alternate reality in which you (or at least your Lost character) appears all over history & pops up in random movies. "Q: Is Jorge Garcia in the movie Big Top Pee-wee?" "A: Indeed he is. Jorge Garcia plays affable slacker Hurley in the movie Big Top Pee-wee. Need anything else? Just ask ChaCha." "Q: Is Jorge Garcia in the science fiction novel Mona Lisa Overdrive?" "A: Indeed he is. Jorge Garcia plays affable slacker Hurley in the science fiction novel Mona Lisa Overdrive. Need anything else? Just ask ChaCha." "Q: Is Jorge Garcia in the video game Halo?" "A: Indeed he is. Jorge Garcia plays affable slacker Hurley in the video game Halo. Need anything else? Just ask ChaCha." What do they do, just make stuff up? Geez. How do you get confused about that? I mean, what movie did he watch? 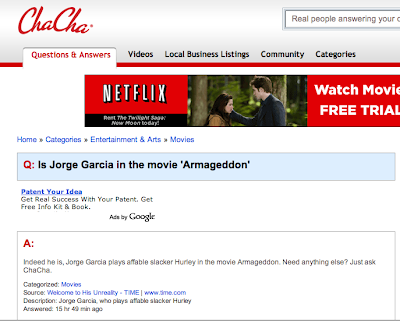 Note to self: Do not use Cha Cha when looking for answers to entertainment questions. Darn, well don't have to watch Armageddon now, is there any other movies that you are 'not' in? Like maybe you were in Star Wars? But we don't want it to end. I still remember the day in August 2004?? when our family took a trip to Manoa to visit my husbands mama-san, while driving around we stumbled across a crashed plane from an airline named Oceanic. Well we knew it had to be from an awesome new movie or tv series. Had no idea it would be as great as "LOST". To see the last episode will be sad indeed. Thanks for everything!!!! Well that's weird! Where do these people get their info, Mars? Or maybe it was on the asteroid that was plummeting to the earth! Hello! I like the word affable. Sure he was- right next to Emo Phillips and Lola Falana- in the big dance scene with the monkeys and the linguini? Come on..you remember... Armageddon-by Trey Parker and Matt Stone? oh wait... no I'm completely wrong. Guess I'm not Chacha. Cha Cha's been slacking. I once got an answer that had nothing at all do to with the question I asked. what can you expect from someone named chacha? Haha. At least they called you affable. You might not be in Armageddon, but affable you are! Call George Lucas...I'm sure he could get you in it for the re-release. Heck, I would pay good money to see that! I wonder if I was in Armageddon. How could you possibly NOT remember being in a movie?! Seriously if it is on the interwebs it is true! Now If you will excuse me I have to help out some DR. in Nigeria get some money out of some account. Hmmm. I thought that was Independence Day. Wasn't Hurley the one who finished off the mothership alongside Jeff Goldblum? Ouch. I worked or Cha Cha when it first came out we were good people. But it soon because people robot answers and people answering with BS just to get a few cents. Armageddon, Lost? What's the difference? Your character is affable though. At least they got thar right. I hate to see your schedule wide open...:( What on earth am I gonna be obsessed with now!! I often come to this blog when I need cheering up because Jorge you just make me happy. And today I really needed it. And I got it. I actually laughed out loud for a few minutes reading the ChaCha response & your own response. You know, if you squint really hard, Jorge might slightly resemble Ken Hudson Campbell who actually was in Armageddon. i am such a fan of yours! can't wait until tonight's episode, lost is on fire! Haha. You should definately just go along with it and take the credit for it.